Section 147 and 148 of the Income Tax Act permits the Income Tax Department to reopen and reassess one’s IT returns which already filed. Stay tuned for the Better understanding of Assessment or Reassessment U/s 147 and 148 of Income Tax. B) the income return of the person in question other than the assessee, who is subject to assessment based on the provisions of the Act in the year before the relevant assessment period. Section 148 of the Income Tax Act bestows the potential of either assessment or re-assessment of any taxable income for which assessment is necessary, however, has not been evaluated as per the guidelines of the Act. If the Assessment Officer has any reason to suspect that any taxable income must have avoided the assessment, he can initiate assessment or re-assessment according to the provisions under section 147 to section 153. The Assessment Officer needs to have concrete evidence on the avoidance of assessment of taxable income by the assessee, to issue the notice. The evidence or information provided should not be vague, ambiguous and consist of superficial figures. Before issuing a notice, the Officer has to cite valid reasons why he believes that the assessee has evaded assessment of income, in writing. Without presentation of correct information the officer cannot issue a notice to the assessee by opinions. In case any data has been concealed by the assessee, and the assessment officer’s attention is brought to it quite later, the officer can issue a notice to the assessee under section 147/148. 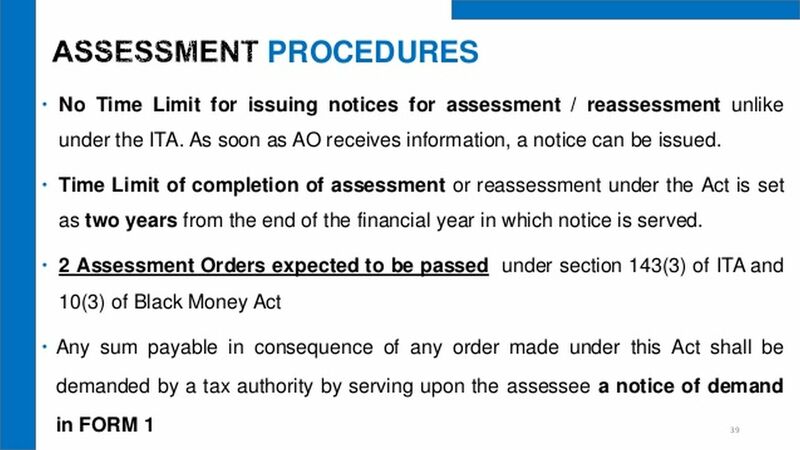 (i) The notice cannot be issued by an Assessing Officer under section 148, following the expiry of four years from the conclusion of the particular assessment year, until and unless the Chief Commissioner or Commissioner is convinced about the reasons for the issuance of Notice submitted by the Assessing Officer. 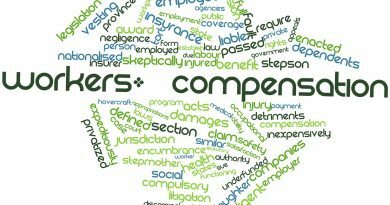 (ii) Other than cases which fall under part (i), notices cannot be issued by an Assessing Officer, whose rank is below the Joint Commissioner. Only if the Joint Commissioner is convinced about the reasons for the issuance of Notice submitted by the Assessing Officer, can issue a notice. (iii) For cases falling under part (i) and (ii),if the Chief Commissioner or the Commissioner or the Joint Commissioner, as per the case, is convinced of the reasons submitted by the Assessing Officer about the case being strong enough to get a notice issued, he or she is not required to issue a notice only by himself or herself. Ideally, the period ranges between 4-6 years. If the taxable income evaded is less than Rs.1lac, the applicable time limit is four years from the conclusion of the relevant assessment year. If the income evaded is equal to or exceeds Rs.1 lac, the time limit is six years from the conclusion of the relevant assessment year. If the income that has avoided assessment about assets, the time limit is16 years from the conclusion of the assessment year. In addition to the above provisions, the first one provides that in case the assessment is being completed u/s 143(3) or u/s 147- post expiration of the four years from the conclusion of the assessment year, no measures to be taken. But only until the reason for taxable income gets evaded for assessment for the particular assessment year. Assessment is when the assessee either fails to file a return u/s 139 or fails to respond to the notice issued u/s 142- first provision or u/s 148 or fails to disclose all the material facts completely which are essential for his assessment for that particular assessment year. The Second provision of section 147 mentions that the first provision will not be applicable to a case wherein the income that has evaded assessment is based on assets which are situated outside the country. Post receipt of the notice issued u/s 148, the assessee is required to file the return of the particular assessment year. Following this, the assessee has to request a copy of the reasons cited for the issue of this notice u/s 148, and could also file an objection to this issuance of the notice, by providing valid reasons for the disapproval. The assessee needs to request the assessing officer to give valid reasons, and in case officer dismisses the claims made by the assessee. 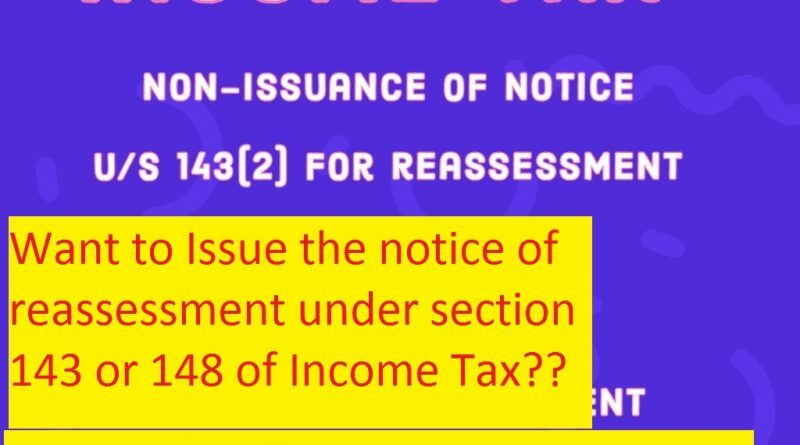 That the assessee has challenged the legality of this issuance of Notice u/s 148. The above can be explained with reference to the case of Ankita A Choksey vs. ITO (Bombay High Court) wherein the petitioner (Ankita A Choksey) challenges the notice issued u/s 148 by the ITO providing valid reasons and proof that she has declared all the taxable income and has not evaded tax in any form. The petitioner states that though she had filed income, no assessment made u/s 2(40) of the Act; instead for the return of income was processed only u/s 143(1), and the order to be withdrawn- which was objected by the assessment officer without logical reasons. How to file an Electronic Audit Report? January 17, 2016 Manager Comments Off on How to file an Electronic Audit Report?